I have just found a document from 1996, the title of which strongly suggests that the 1995 Quebec referendum to “secede” (i.e., force all of Canada to “negotiate” a regional union) just missed the Soviet boat. I’ve written this article in the order in which known information came to mind, topped off with the final research toward the end, which confirmed my intuition. then why would the Quebec Left in 1996 associate the very object of the 1995 Quebec referendum to “secede” with an ultimate triumph of the old Soviet Union? I think the Left slipped up in a major way when certain exponents of it conferred a particular book title on a collection of essays on the 1995 Quebec referendum. 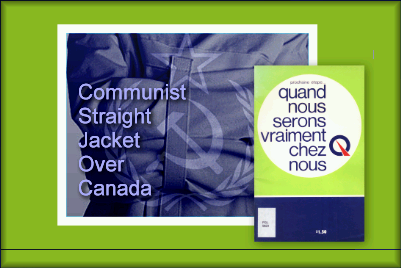 That book title inadvertently exposed the fact that Quebec’s referendums to “secede”, led by the veiled Communist Parti Québécois, are a Soviet tactic for restructuring Canada and North America. The Soviet Union therefore necessarily did not “collapse”. KGB defector, Anatoliy Golitsyn, in his 1995 book The Perestroika Deception, points out that the USSR undertook a superficial or “cosmetic” transformation to facilitate its own “convergence” with a “restructured” West. After years of historical and constitutional research, it is my view that the Quebec referendums are undoubtedly one tool of that restructuring. Middle-class French-Canadians unknowingly wave North American Union banners during 1995 Quebec “secession” rally. Moreover, as basic investigation will indicate — from the 1964 video footage of Communist Lévesque sweeping his arm across a map of Canada calling for its “profound” “restructuring”, to the questions on the 1980 and 1995 referendum ballots — the real goal is not for Quebec to become “sovereign”. The goal is for Quebec to use a threat of dismantling Canada by secession, to force the “rest of Canada” to negotiate its complete restructuring to match whatever then-current stage of development is found in the European region. In 1980, that stage was the European Economic Community (EEC). In 1995, it was the European Union (EU). Whatever the stage, for the clear purpose of deception, the desired restructuring is always called: “Canadian unity“. 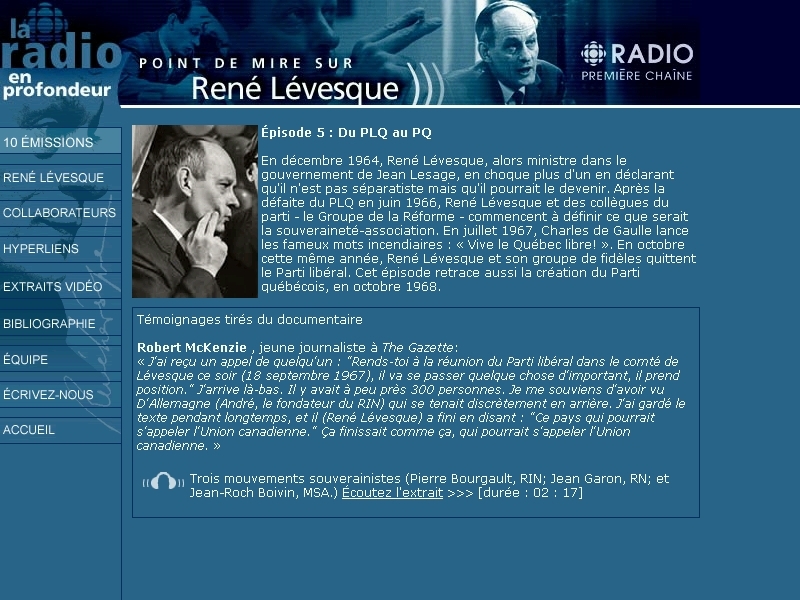 René Lévesque, in English-language video footage, declares that the powers gained by Quebec in “seceding” will eventually be relinquished to unidentified recipients. These can only be regional authorities, municipal authorities and world government in a world state where nations have ceased to exist, and only cities and regions are on the signposts. Le goût du Québec. L’après référendum 1995. Des lendemains qui grincent… ou qui chantent? The part entitled “Des lendemains qui grincent” (“Grinding tomorrows”), has been written under a single name, the pseudonym “Jean du Pays“. “Jean du Pays” is a French pun on the title of a famous French-Canadian patriotic song, “Gens du pays” by Gilles Vigneault with music co-written by Gaston Rochon, and first performed by Vigneault on June 24, 1975. In contrast to “Des lendemains qui grincent“, we have a cluster of authors unified under the necessarily (as we shall see) militant Red theme of “Singing tomorrows” — “Des lendemains qui chantent“, the ultimate triumph of the apparently not really reformed Soviet Union. We have Myra Cree, Henry Mintzberg, Julien Bauer, Peter G. White, Claude Corbo, René Boudreault, Marco Micone, James O’Reilly, Robin Philpot, Bernard Cleary, Joseph Rabinovitch, Louis Cornellier, Isabelle Guinard, and Naïm Kattan, with Philippe Resnick in annex and labor commissioner, Marc Brière (aka the class-conscious Marxist “judge”) doing a post-script. A veritable “multicultural” plea for a new, essentially “territorial” common “nation” and new “people-hood” in order to re-engineer the vote next time for the desired outcome. The expression, “singing tomorrows” is a well known paean to the eventual triumph of the Soviet Union, as will be more clear further below. Ancien élève du collège Stanislas de Montréal, il [Brière] passa deux ans à l’école navale de Royal Roads, en Colombie britannique, et devint officier de la Marine Royale du Canada, pour entreprendre ensuite des études de droit aux universités de Montréal et de Paris. Membre de Cité libre et de la Fédération libérale du Québec, il participa activement à la Révolution tranquille aux côtés de Paul Gérin-Lajoie et de René Lévesque. Il contribua à la fondation du Mouvement souveraineté-association, en 1967, puis à celle du Parti québécois. Robert Bourassa le nomma au Tribunal du travail en 1975. A former student of Stanislas College in Montreal, he [Brière] spent two years at the Royal Roads naval college in British Columbia, and became a Royal naval officer of Canada, to then take up the study of law at the universities of Montreal and Paris. A member of Cité libre and the Liberal Federation of Quebec, he took an active part in the Quiet Revolution at the side of Paul Gérin-Lajoie and René Lévesque. He contributed to the founding of the Mouvement souveraineté-association in 1967, and to that of the Parti Québécois. 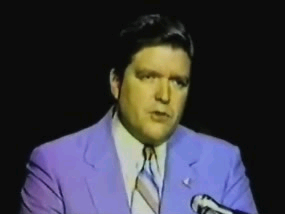 Robert Bourassa appointed him to the Labor Board in 1975. So, Brière has a personal interest and investment to vindicate in this book. He is a founding member of the MSA which was organized to become the veiled Communist PQ. He is a “member” of Cité libre run by and for the goals of Communists in Canada. He is thus close to secret committee men from Cité libre who ordered the Parti Québécois to be set up in the first place. He helped to set it up by contributing to the founding of the MSA which led to it. Brière then worked for the Parti Québécois for four years “in government”. Brière is thus an insider. 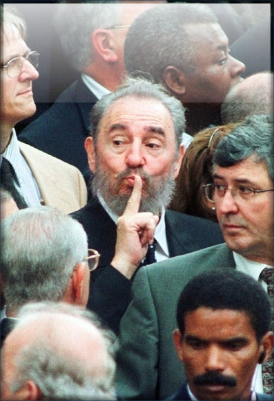 His 1996 book is necessarily a Communist tactic. He even got himself a little military training at the expense of Canada; and so he was possibly in a command chain at the time of the 1995 referendum. The implications of his book’s title, discussed below, should be taken seriously. Alan Stang in “CANADA” (April 1971) identified Cité Libre as harboring Communists. Robert Rumilly (The Leftist Infiltration in French Canada, 1956 / L’Infiltration Gau­chiste au Canada Français) identified Cité Libre as the self-described “little sister” of Esprit, a crypto-Communist magazine in France founded in October 1931. Esprit’s first issue featured a favorable travel journal of a voyage behind the Iron Curtain. We later find the principal figures of Esprit linked to UNESCO at the founding of the UN. You can search the UNESCO web site today for the names of Emmanuel Mounier and Jacques Maritaine, both leading lights of the crypto-Communist Esprit. 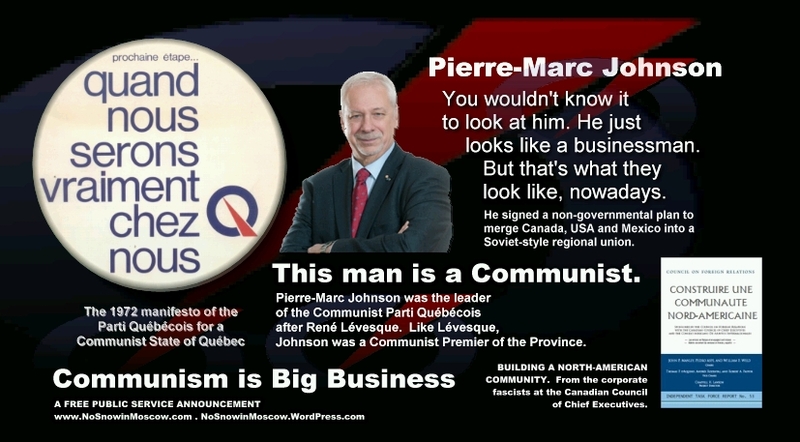 With Marc Brière, we are thus firmly on territory of the far left associated by “former” Marxist-Leninist leader, Jean-François Lisée,* with Power Corporation of Canada, whose “secret committee” of Communist-infested “Liberals” in the federal cabinet of Soviet agent and (de facto) prime minister, Lester Bowles (aka “Mike”) Pearson, appointed René Lévesque to set up the “separatist” Parti Québécois and the referendums. 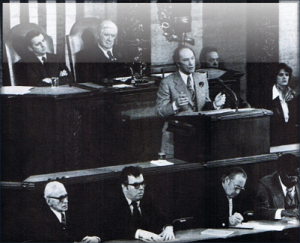 However, the Parti Québécois is a veiled Communist party, according to the terms of its own 1972 manifesto, which proposed a totalitarian government to run the economy, centralized production, the virtual obliteration of private business, and a self-managed work-force, all on the model of what Charles Perrault, then of the Conseil du patronat (Quebec Employers Council) and Narciso Pizarro, a Marxist socialist, both identified as the kind found in “socialist countries” such as Yugoslavia, Czechoslovakia and Poland. 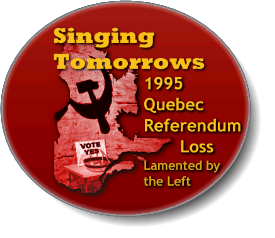 Given the title of this 1996 post-referendum book of Brière’s, “Singing tomorrows”, one may reasonably infer that not only has the purpose of the Parti Québécois not changed since 1972, but in some as yet unknown way, it is a direct creation of the Soviet agenda for the overthrow of North America. 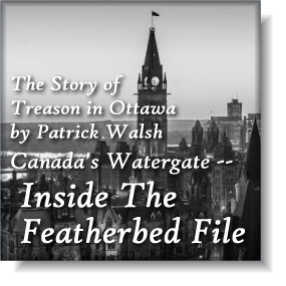 In a future post, I will explain the links discovered between international covert intelligence operations, the “secret committee” of Power Corporation, UNESCO, the creation of the Parti Québécois, and North American Union. All this merely underscores the interpretation to be made of the book’s French title, explained in detail below, as implying that the failure of the 1995 referendum narrowly averted a Soviet overthrow of Canada. Thus, the clear allusion in the title, in effect the banner under which the small host of writers has come to collaborate, is that the failure of the 1995 Quebec referendum was a near-miss to a Soviet takeover. Moreover, the authors are writing in 1995-1996, well past the alleged “collapse of the Soviet Union” at the hands of Mr. Glasnost, or Mr. Perestroika, as you will, Mikhail Gorbachev. Keep in mind the name of KGB defector Anatoliy Golitsyn and his important books, New Lies for Old and The Perestroika Deception, in which Golitsyn only feigned “collapse” as a tactic in its “long-term strategy”. Anatoliy Golitsyn was born in the Ukraine in 1926. He became a member of the Communist Party of the Soviet Union at the age of nineteen, when he also joined the KGB. In 1959, he graduated with a law degree from a four-year course at the KGB Institute in Moscow. He “graduated from the Moscow School of Military Counter-espionage, the counterintelligence faculty of the High Intelligence School, and the University of Marxism-Leninism” according to his profile in the foreword to his 1995 book (paperback 1997), The Perestroika Deception. From 1959 to 1960, Golitsyn served as a senior analyst in the NATO section of the Information Department of the Soviet intelligence service. He repeatedly served in Vienna and Helsinki on counterintelligence assignments. Given the title of Marc Brière’s 1996 socialist lament for the failure of the 1995 Quebec referendum (no “singing tomorrows”), then mutatis mutandis, I would ask, is Arbatov’s Institute for the Study of the USA and Canada involved in “Canadianising” Communism and dressing it up in the ‘democratic garb’ of Quebec referendums under the Communist-infested Parti Québécois which is a “false representative institution”? The referendums to “secede” (translation: to force the rest of Canada to “negotiate” the new regional system unfolding in Europe) are not only unconstitutional, they are forbidden by it. I can explain this quickly in a way that Americans in particular will understand, because they understand the political and legal purposes of their own constitutional division of powers. I am referring to the distribution of legislative and political power between the federal and State levels. In America, the central or federal government has “enumerated” powers, a legal term meaning that its hands are tied; it can do only those things on the list of powers that constitutionally it is given to do. As a result of this Canadian division of powers, a province literally has no power to take any steps outside the list, including holding referendums to “secede”; or drafting “laws” with preambles containing a unilateral declaration of independence, etc. There is no power on the list under which it can be done. The Canadian division of powers was designed specifically to prevent them doing it. A province has no power to “secede”, and therefore no power to take a step in that direction, intended to facilitate “seceding”. The 1998 opinion of the Supreme Court of Canada pretending the constitution (the current one, part of a coup d’etat imposed by Trudeau in 1982, with much of the language of the 1867 original) is “silent on the ability of a province to secede”. They lied. They ignored the division of powers deliberately, as well as every other feature designed to deny a provincial power to secede, or a federal power to annex Canada… to the USA or (ejusdem generis rule) into a regional union. There is no power in the lawful Constitution for a Province to “secede” or to do anything “in relation to” (legal term) seceding. The provincial powers reserved to a Province in Canada are enumerated, i.e., confined to the list of constitutional subject matters. A Province can do nothing that is “in relation to” “secession”, which includes conducting referendums “in relation to” “seceding”. Gilles Duceppe (“former” Marxist-Leninist-Maoist) of the veiled Communist Bloc Québécois (at the federal level) has suggested that Quebec has a parliamentary “privilege” to conduct the referendums and to ask the public any question it pleases. This is untrue. Parliamentary privilege is confined to the exercise of existing legal powers essential to the conduct by the Legislature of its affairs as such a Legislature. There is no “parliamentary privilege” to act as a putsch, or in any way outside the existing legal powers of a Province. Privilege ceases to exist when the Legislature clearly shows by deliberate unconstitutional behavior that it is not acting as a Legislature, but as the perpetrator of a coup: i.e., as a usurper. Further, Provincial powers are confined to their local territory. No Province can take any action which substantially affects any other Province or all of Canada. In other words, a Province has no such “extra-territorial” power. Therefore, referendums in Quebec as a pretext to “negotiate” the restructuring of all of Canada are fundamentally extra-territorial in character (legal term), and therefore unconstitutional. Trudeau, a constitutional lawyer, and a law professor, knew that a Province has no power to “secede”. He thus used a ploy to conceal the illegality: he tabled a federal Bill to conduct a Canada-wide referendum on “national unity”, while declaring that the referendum might be done instead only in Quebec (under his Communist friend, Lévesque). The federal Bill was never passed (which saved it from judicial review and thus from exposure as unlawful: — the federal government, also, has no constitutional power to dismantle Canada). But the public fell for it: the illegal Quebec referendums have proceeded since that time on a blind assumption derived from Trudeau’s unlawful public statement. The entire operation is an exercise in mass mind-control, which depends in turn upon media control. The latter has been achieved, for example, through creation of the State-controlled CBC-Radio Canada which underpins the sedition, subversion and propaganda of the Left, wrongly conveying these to the public as normal events; while planting fifth-columnists (such as Rhodes Scholar Rex Murphy and Bilderberger Peter Mansbridge) in editorial news positions to help engineer public compliance with illegality until Canada is done and disposed of. It can be no coincidence that Pearson retired suddenly while in office, the same year the secret committee decided to create the veiled Communist Parti Québécois (PQ). Pearson’s retirement allowed Trudeau to rise from that secret committee to the Prime Minister’s Office, precisely in time to seem to “fight” “Lévesque’s” new “separatist” party to “save” Canadian “unity” by “negotiating” the European system to replace Confederation. The very system Mikhail Gorbachev has called “the New European Soviet”. The Parti Québécois which is running these referendums therefore certainly fits the label of a “false representative institution”. The Soviet ploy for convergence thus obviously includes not only the creation of false (merely cosmetic) “democratic” agencies in Communist countries to encourage convergence, but the concocting of false “political” parties and other “dummy” entities in target countries to guide their dismantling, ostensibly by their own citizens under the guise of “democratic” procedure. Now, let me get back to the sinister title of Brière’s 1996 anthology. I am reading that anthology now. So far, its appearance immediately after the failed 1995 referendum seems to be an aggressive tactic to keep the “secession” ball in the air. However, I will not discuss the various articles in the book right now. I will stick to the title of the book, which is fundamental. In particular since it also serves to divide the book into two sections, “Singing tomorrows” (implied Soviet victory) and “Grinding tomorrows” (misery until the day of victory). I would not have recognized the allusion to ultimate Soviet victory in the title of the 1996 book on the 1995 Quebec referendum, but for Alan Stang. The 1971 offprint by American Opinion of Stang’s CANADA How The Communists Took Control features a reproduction at p. 14 of a telegram sent by a known Soviet agent (exposed by Igor Gouzenko): one Jean-Louis Gagnon. Gagnon used the expression “singing tomorrows” in connection with an eventual triumph of “the great Soviet Union”. D-Day was the date of the Allied landing in France, in World War II. Mitchell Sharp deserves further mention. 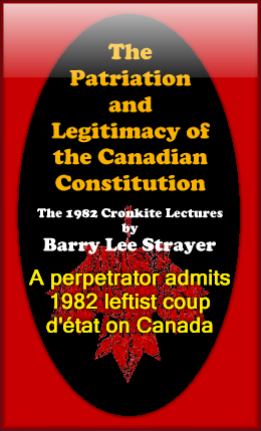 Sharp — who helped to protect the Soviet infiltration of Canada that Gouzenko had begun to expose — would become a future Trudeau advisor, and a future member of David Rockefeller’s Trilateral Commission. Sharp is seen here whispering in Trudeau’s ear at the Liberal convention which elects Trudeau as de facto Prime Minister (Alan Stang has generally described this event in his chapter “The Big Switch”). The Rockefellers’ Chase Manhattan was among those banks (Kuehn Loeb of the Warburgs was another) which deliberately and consciously financed the 1917 Bolshevik revolution. That so-called “revolution” was in fact the aggressive invasion of Russia by radical Communists. The so-called “revolution” resulted in the deaths of tens of millions of innocents, mostly Christian Russians. It created the most brutal tyranny the world has ever seen, whose butchers have never been brought to justice despite the alleged “fall” of the now “former” Soviet Union. After a “cooling off” period, Jean-Louis Gagnon returned from Brazil only to be employed by the federal government of Canada! 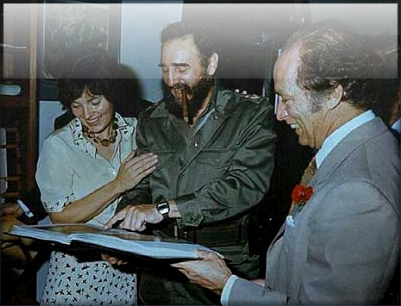 Most notably, he found protection with “pilgrim of Moscow” Pierre Elliott Trudeau, as Quebec historian Rumilly calls him. 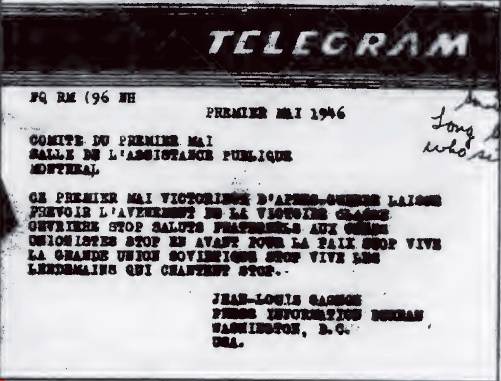 Stang points out that Gagnon’s telegram, sent from Washington to a Communist May-day rally in Montreal on May 1st, 1946 conveys the adoration of Gagnon for “the great Soviet Union”. Stang was not alone in publishing a copy of the telegram. In the same month of April, 1971, the journal Straight Talk! of the Edmund Burke Society (EBS) (based in Scarborough, Ontario), also featured an image of the telegram. Its unsigned article said that Jean-Louis Gagnon had been “a member of the Communist Party” at the time he sent the telegram to a Communist May Day rally. Telegram sent by Soviet agent and Communist Party member Jean-Louis Gagnon to a Montreal Communist May-Day Rally on May 1st, 1946: “Singing Tomorrows” (“les lendemains qui chantent“), published in the April 1971 issue of Straight Talk!, journal of The Edmund Burke Society (EBS); and by the John Birch Society in the April 1971 article in American Opinion by Alan Stang entitled “CANADA How The Communists Took Control”. The explanation provided in the footer to the song at the web site of the Parti socialiste, in the section “Centenaire du Parti socialiste” (Centenary of the Socialist Party) describes the fifth and final stanza of the same song as an allusion to the Communist war-cry of the French Front. The French Front was the enlargement of the Front Populaire (Popular Front) to include Catholics and former members of the “Croix de Feu” (Cross of Fire). The theme of “we will build a singing tomorrow” is taken up again by the militant Communist, Gabriel Péri, in his final letter, before being executed at Mount Valérien in December 1941: “je meurs pour des lendemains qui chantent” (“I die for singing tomorrows”). Péri’s 59-page autobiographical letter was published posthumously in Paris in 1947 by Éditions sociales under the title, Les lendemains qui chantent. This was one year after Soviet agent Jean-Louis Gagnon’s May 1st telegram to the Communist May-Day rally in 1946. However, the phrase was already current from Paul Vaillant-Couturier’s Communist battle hymn of 1937, Jeunesse. See: SearchWorks catalog at Stanford University Libraries. Les Lendemains qui chantent : autobiographie, Péri, Gabriel, 1902-1941. Paris : Éditions sociales, 1947. Paul Vaillant-Couturier (1892-1937) was a journalist, writer, member of the French parliament, and editor-in-Chief of the Communist review, l’Humanité. To sum up, the very title of this 1996 anthology — “Le goût du Québec. 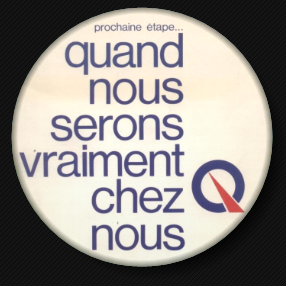 L’après référendum 1995. Des lendemains qui grincent… ou qui chantent?” — by a raft of socialists lamenting the 1995 Quebec referendum loss, appears to imply that the Left expected a Soviet conquest of Canada in 1995 by means of the ballot box. International state recognition of Quebec and the other dismantled Provinces would have conferred a “treaty power” so that all might sign “treaties of accession to the European system”. A system that Mikhail Gorbachev has called “the new European Soviet”. The phrase “les lendemains qui chantent” in the title of the 1996 book therefore suggests that Jean-Louis Gagnon’s “great Soviet Union” indeed has not collapsed: the Quebec referendums are a “specifically national tactic” — a part of its “Long Term Strategy” for complete Communist conquest. Anatoliy Golitsyn warned in his books New Lies For Old, and The Perestroika Deception, that the Soviet Union did not collapse. It went “underground” in execution of a long-range strategy of “convergence” with and “restructuring” of Western countries. 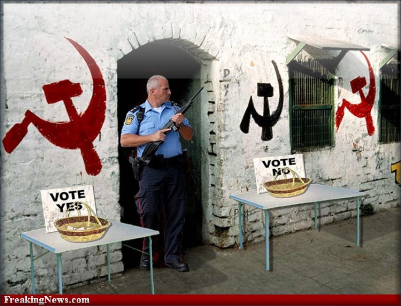 The Quebec referendums under the Parti Québécois in 1980 and in 1995 were attempts to fundamentally restructure all of Canada for Communism. The referendums (for both political dismantling and horizontal east-west restructuring on the heels of socialist policies), are interspersed with “trade deals” for vertical north-south integration, restructuring and convergence. 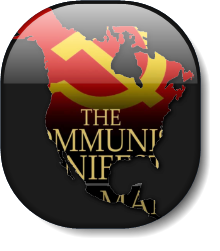 The so-called “trade deals” are a pretext for the vertical integration of Canada, USA and Mexico into a Communist regional union. So far, the power centers of the existing nation-state framework — although controlled from without — remain within their original countries. It is absolutely essential to recover constitutional control of these power centers — our national governments — before they are used to dismantle us. It may or may not be possible to do this politically; but it must be done, legally. 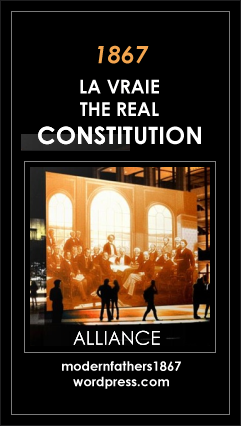 It is vital to launch constitutional challenges to unconstitutional action and to hammer our respective rogue governments with a torrent of constitutional lawsuits. The people must not be presumed to accept or to obey our unconstitutional regimes. Above all, we must not allow ourselves to be manipulated into cooperating or even seeming to cooperate with our nations’ demise. The international community views non-revolt as passive compliance. Looking over the list of writers who contributed to the 1996 anthology, most are not yet familiar to me. However, a couple stand out. Peter G. White is President of the Canadian branch of the Royal Institute of International Affairs, the world-government crowd, i.e., the Canadian Institute of International Affairs (CIIA) now called Canadian International Institute (CIC) and simply “Open Canada”. The CIC named billionaire Communism-promoter, George Soros, “Globalist of the Year” in 2010. White is also Vice-president of the phony Council for Canadian Unity, which keeps the “secession” ball up in the air so Quebec can be used to dissolve what remains of the constitution of Canada for regional “union”, that being the real meaning of “unity”. Also at the time of publishing the 1996 book, White is an associate of Conrad Black and is President and administrator of the Quebec branch of Black’s Hollinger Inc., which owns a slew of French-language Quebec daily newspapers, including Le Droit in Ottawa-Hull. 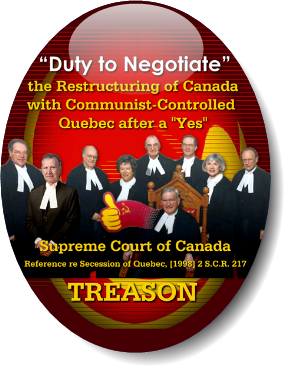 Le Droit is known to have been involved in manipulating political affairs in Ontario linked to the 1998 Supreme Court of Canada “Quebec secession” Reference. (Well, it’s known to me, anyway, in addition to being known to the “secession” conspirators; I’ve done my homework. The case in question is Lalonde v. Ontario (Commission de restructuration des services de santé), 2001 CanLII 21164 (ON C.A.) [56 O.R. (3d) 577]. In addition, White was sitting on the Boards of Directors of Téléglobe, Télésystème Inc., and Southam Inc., all bastions of communications and media control. Through the CIIA and Southam, White is therefore linked to Power Corporation of Canada, which sits on the Board and Senate of the CIIA (world government), and which purchased the money-losing Southam chain of newspapers in 1994. Power Corp. thus acquired control of Quebec’s one and only English-language daily newspaper, The Montreal Gazette, the year before the 1995 Quebec referendum subject of the 1996 anthology. Power Corp. appointed a new publisher, Michael Goldbloom to run The Gazette. Goldbloom, along with other Gazette figures including Editor, Sheila Fraser, published signed editorials urging English-speaking Canadians in Quebec to vote “Yes” in the upcoming 1995 referendum. 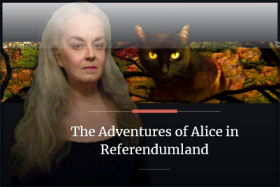 Fraser was later appointed to Canada’s Senate where she led a Senate committee to unlawfully adopt the 1998 Secession opinion of the non-judicial advisory board of the Supreme Court of Canada as the so-called “Clarity Act”, a federal “law” purporting to authorize Quebec “secession”. White moreover was principal Secretary to Prime Minister Brian Mulroney (Mr. NAFTA, i.e. Mr. Continental Union) from 1983 to 1986. From 1986 to 1988 White was chairman of Domgroup Ltd. and editor of Saturday Night Magazine: more media control. White is linked to Maurice Sauvé, who sat on the secret committee of socialist-infested “Liberals” at Power Corporation of Canada. That secret committee of mostly Ministers from Quebec in the federal cabinet of Soviet agent Lester Bowles Pearson instructed Communist René Lévesque to create and lead the Parti Québécois (PQ) in 1967. The PQ ran both Quebec referendums to “secede” in 1995 and 1980. The PQ’s political manifesto is Communist; that’s the one I’ve been translating. Look for it in the sidebar: Quand nous serons vraiment chez nous. Charles Taylor is a Rhodes Scholar with a PhD in philosophy from Oxford; and is President of the Quebec Section of the New Democratic Party (NDP), as well as leftist “guru” to the late Jack Layton, the former leader of Canada’s federal NDP, which is a full member of the Socialist International (SI) and signed up to world government. The NDP’s party constitution intends to abolish private property. In the back of the 1996 anthology, Taylor is declared to be a “world recognized authority”, having published, amongst others, Explanation of Behaviour (1964), Pattern of Politics (1970), Hegel (1975), Hegel and Modern Society (1979), Philosophical Papers (1985), Sources of the Self (1989), and The Malaise of Modernity (1991). Taylor is a member of the Royal Society of Canada and of the British Academy. As a Rhodes Scholar, he himself is undoubtedly one of the chief causes of the “malaise of modernity”. Charles Taylor is perhaps best known in Quebec for his cheer-leading of the French Canadians in an attempt to destroy their racial and cultural homogeneity through a process of endless “reasonable accommodation” of the 200+ cultures of incoming mass-immigrated foreign races imported for the purpose of anti-national unconstitutional “multiculturalism”…. apparently the intended format of the upcoming multicultural regional North American Union. * Lisée is counted among “former” “(translation:) leaders of Marxist-Leninist organizations in the 1970s, who joined the upper spheres of the bourgeois political class after having atoned for their “crimes” and expressed their repentance”. That quote is from issue No. 71 (20-11-2005) of the Drapeau Rouge Express (Red Flag Express), the online journal of the Parti Communiste Revolutionnaire (Revolutionary Communist Party). Also see the book: Ils voulaient changer le monde. Le militantisme Marxiste-Léniniste au Québec (They wanted to change the world. Marxist-Leninist militancy in Quebec) by sociologist, Jean-Philippe Warren. Lisée himself addresses the history in that book during a radio broadcast by the French-language CBC (Radio-Canada) entitled “Le marxisme-léninisme, une utopie?” aired on Monday, October 22nd, 2007. The thing is, Lisée is not a “former” Marxist-Leninist. He’s doing the regional union now, under protection of the so-called “bourgeoisie”, the super-capitalists. 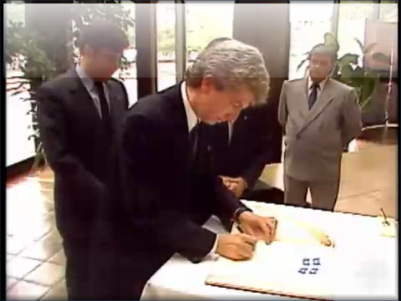 Lisée crafted the strategy for the 1995 Quebec referendum and wrote the question on the ballot. We are supposed to believe that these “former” Marxist-Leninists “repented” of their “crimes” and joined the “Establishment” in politics. I think that is as much of a myth as the Cold War and the fall of Communism. These men are conducting their revolution, right now, under protection of the so-called “bourgeoisie”, the bankers and the supercapitalists, without whose money the first Bolshevik Revolution could not have been done. The Communist revolution is underway. They are replacing our populations with mass immigration, they are changing the form of government, eliminating international borders, they are forming the regional unions. Everything they are doing now in Establishment “politics” is what the Marxist-Leninists always wanted to do. Could it be that the Establishment has fooled the Marxist-Leninists? Or have the Marxist-Leninists fooled the Establishment?